My good friend Jess sent me the recipe for this frittata and it sounded so good, I couldn't wait to make it. 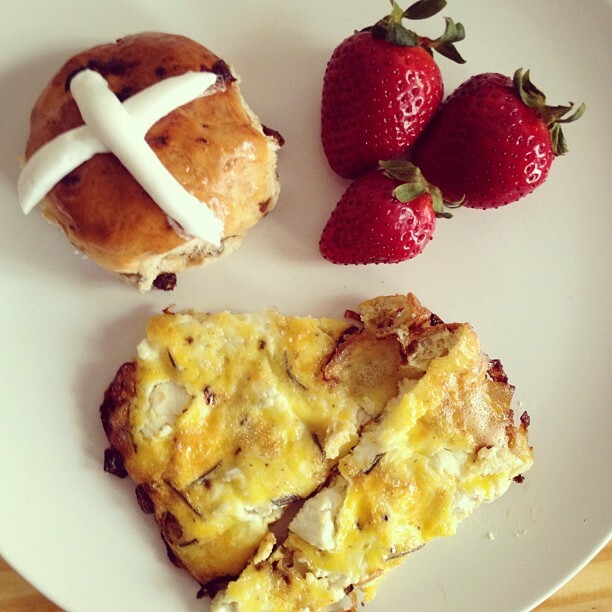 I threw it together on Sunday morning and had it with a hot cross bun—my absolute weakness during springtime. Easter is approaching and that means they're everywhere. I can't resist! I love them. 1) Preheat oven to 450°F. 2) In a large, oven-proof skillet, heat butter and oil over medium heat. Add onions and saute on low heat for 30 minutes. You want them to get nice and caramelized—they should be transparent and soft and slightly golden. 3) In a bowl, beat eggs and milk, mix in salt, pepper and rosemary. 4) Pour mixture over onions in skillet; let sit for about 4 minutes, until bottom of eggs is set. 5) Dot the top of the frittata with plops of goat cheese. 6) Move skillet to oven and bake for about 12 minutes. The edges should start to get a little golden. Remove from oven and let cool, then slice with a spatula and serve. Head over to Two Recipes for step-by-step photos as well. Enjoy!